Welcome back to CSN’s monthly “Stormwater Spotlight”! This month we are heading back out to the West Virginia panhandle to shine the spotlight on Berkeley Springs! If you would like to nominate a program for a future feature, please contact David Wood (Wood.CSN@outlook.com). When it comes to stormwater management, much of the attention usually goes to the MS4-regulated communities. But as a recent analysis by CSN found, 60% of the developed land in the Chesapeake Bay watershed is not covered by an MS4 permit. These non-MS4 communities have an important role to play in the Chesapeake Bay clean-up effort, but often lack the resources of larger cities. Generally understaffed and underfunded, non-MS4 communities must be creative to accomplish their stormwater goals. That brings us to this month’s spotlight community: Berkeley Spring. 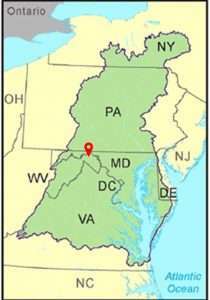 Located in the northern reaches of the West Virginia panhandle, Berkeley Springs is a great example of a community using local and regional partnerships to plan and implement green infrastructure projects. In September 2012, Berkeley Springs faced major flooding after the town was hit with 4-6” of rain in less than 3 hours. Shortly thereafter, the town, with the help of the Region 9 Eastern Panhandle Regional Planning and Development Council (Region 9), began seeking funding to assess opportunities to implement green infrastructure to address their stormwater runoff problem. A Clean Water Act 604B grant was the answer, and in 2015 the Warm Spring Run Green Infrastructure Plan for the Upper Watershed was produced by Thrasher Engineering. Since the release of the report, multiple projects have been identified and installed throughout the community with the help of a range of partners, including the Warm Springs Watershed Association, Cacapon Institute, National Fish and Wildlife Federation (NFWF), and the EPA. A series of projects implemented at the town’s Greenway Cemetery are a great example of how working collaboratively can result in successful project implementation. 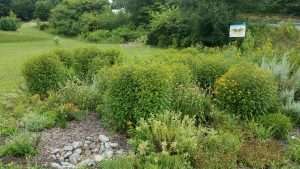 The highlight is a large rain garden, installed by the Warm Springs Watershed Association and funded by a NFWF small watershed grant, with additional assistance from West Virginia Department of Environmental Protection, West Virginia Department of Forestry and Region 9. In addition to the rain garden, more than 100 additional trees have been planted in the cemetery with the help of the WV Department of Forestry and the Cacapon Institute. The site has also served as an opportunity to experiment with several innovative erosion and sediment control techniques for dirt and gravel roads. One steep road is broken up by a series of recycled conveyer belt strips that slow the flow of water and divert runoff into the adjacent turf. The Warm Springs Watershed Association and a team of volunteers also installed an innovative hügelkultur-inspired project that helps slow and absorb stormwater runoff. In addition to working together with a range of partners, Berkeley Springs has relied upon a “Dig Once” mantra when it comes to green infrastructure. A “Dig Once” strategy involves integrating stormwater management into other infrastructure projects, such as roads, school and park improvements. Incorporating stormwater management into other scheduled infrastructure or capital improvement projects can result in improved efficiency and substantial cost savings. Tree box bioretention and permeable pavers on Main St. 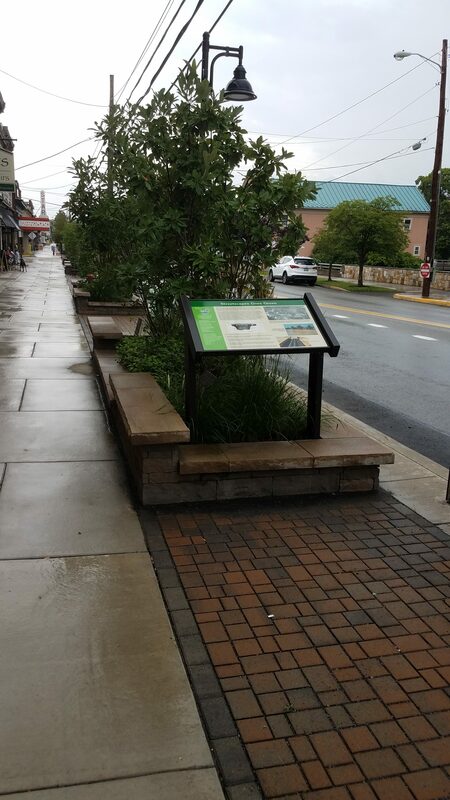 In Berkeley Springs, their community Streetscape Committee put together a master plan in 2008 that identified the need to replace aging sidewalks throughout the town and improve accessibility for community members with disabilities. Region 9 saw that as an opportunity to also incorporate stormwater management into the project. They helped the town seek funding to add a series of tree-box bioretention cells into the design and use permeable pavement as opposed to traditional pavement. The new plans were then incorporated into their watershed implementation plan (WIP). Dedicated funds for the project were shifted from the community’s general fund and combined with funds from a Chesapeake Bay Trust (CBT) grant to complete the most recent phase of the project in 2016. Since completion of the “green street” project, residents in the town have already noticed a difference. When it rains, the ends of the road still flood, but the stretch of Main Street with permeable pavement and bioretention cells stays dry, protecting the local businesses. Support is growing for the projects, and the CBT recently awarded funded to complete the next phase. For other communities interested in exploring a “Dig Once” strategy, the Chesapeake Bay Program’s Local Government Advisory Committee released a report in 2017 outlining recommendations for how to address changes to municipal processes and planning, resource pooling and regional collaborations, and funding and financing. The full report can be accessed here.